There is no doubt that technology has made our life easy and has a positive impact on our daily life. The main benefit is that it has minimised our dependency on humans, which has made travel more convenient than before. Now, we don’t need a travel agent for bookings or a guide to help us navigate a foreign city. All this and more can be easily done via our Smartphone. 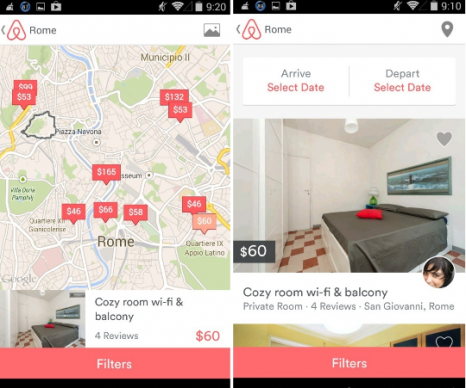 Airbnb is a marketplace app that helps travellers with getting accommodations, regardless of where they are and where they want to go. It connects travellers with registered hosts to find unique accommodations, based on rent amount, number of guests, size or type of accommodation, etc. It has 2+ million listed places in 34,000 cities across 191 countries. The list is browsed by 60 million guests from around the world. Hosts list their extra room, space, apartment, house or even castle for a fair amount of rent. Airbnb not only makes the travel adventurous, it makes it affordable as well. 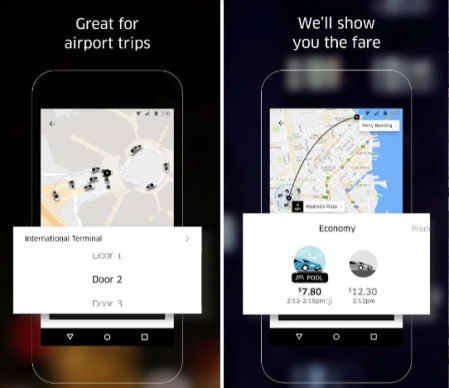 This unique app is specially designed for frequent travellers. 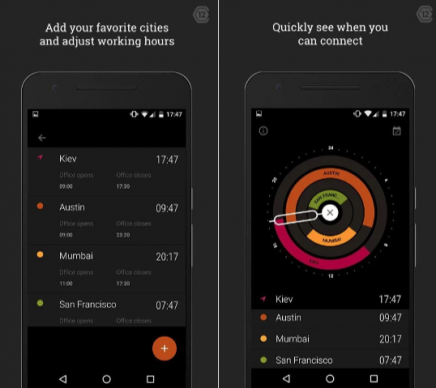 The app tracks multiple time zones visually through a compass, comparing your current location with where are you heading. You can add your home time and it will tell you the most suitable time or a common overlapping time for both parties to connect conveniently. Many business professionals also use it for global networking. CouchSurfing is a way ahead of Airbnb offering free accommodations in exchange of volunteer or household chores. Besides accommodation, CS also acts as a platform for travellers to meet up and lists events from around the world. A member can be a host when home and a surfer when travelling. It is not necessary to just find a host for accommodation. 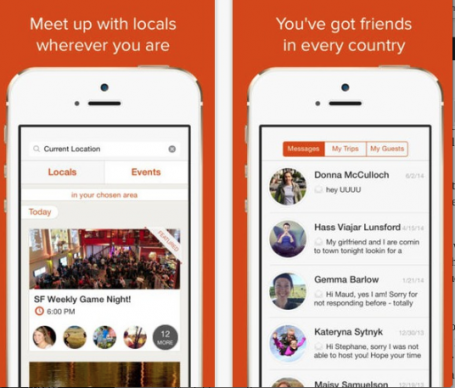 You can hang out or meet up fellow travellers and hosts as well as join local events. Couchsurfing has rapidly grown since 2004. It now has 12 million members in 200,000 cities along with 550,000 events listed around the world. If you are an avid reader and enjoy reading while travelling, then FBReader is perfect for you. It is a fast and reliable eBook reader that supports multiple book formats including ePub, kindle (mobipocket) fb2, rtf, html, Microsoft doc, rtf, and plain text. Other formats such as PDF, DJVU, and comics (CBR and CBZ) are supported via plug-in apps.One unique feature is that it can read directly through zip archives, so you don’t need to unzip folders on your device. 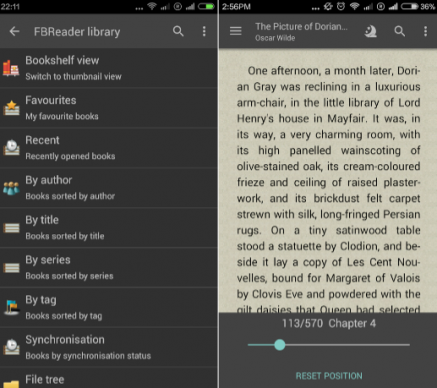 The app’s library is easy and simple to use as it can sort books by title, authors, series, etc. You can download books from its network library on your phone or can sync it with your Google Drive. It also integrates with some famous dictionaries for references and is localised in 29 languages. 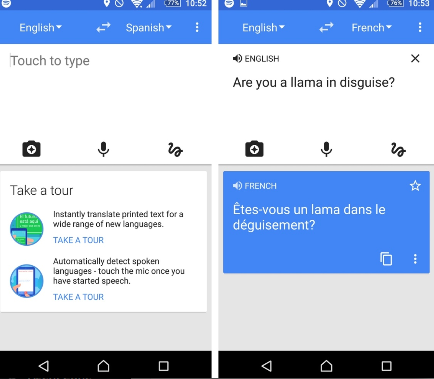 There are many language learning and translation apps, but Google Translate is by far the most used. It quickly translates words, phrases and short sentences from one language to another. You just need to type or dictate the phrase or the word you want to translate, select language and click translate. PureVPN is the world’s leading VPN service with 750+ servers in 141 countries. The need for a VPN is increasing with every passing day because of the rising threats of cyber crime and identity theft. PureVPN can not only keep your online activities private and anonymous but it also secures your digital presence. It is a must-use tool in 2017 for travellers, especially when connected to public WI-FIs at airports, hotels and restaurants, etc. A VPN also helps in accessing geo-restricted content from abroad thus making your travels more enjoyable. It also helps you access blocked services such as Gmail in China, Twitter in Turkey or Skype and other VOIP services in the Middle East. Sygic is the most advanced GPS-based navigation app. 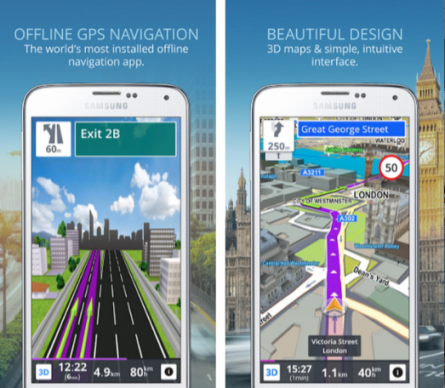 The app offers offline 3D maps, door-to-door voice navigation and free updates. It offers high-end experience with safety and comfort. Some innovative features includes live traffic updates to select the fastest route and avoid traffic delays, police radar and speed warnings to avoid tickets and inconvenience, parking place suggestions with pricing and availability status. You can also share a real-time route with your friends and family, so they can know your exact location and estimate their time of arrival. Another unique feature is the nearby fuel availably, tourist attractions and pedestrian navigation. This app serves as a single map for everything. 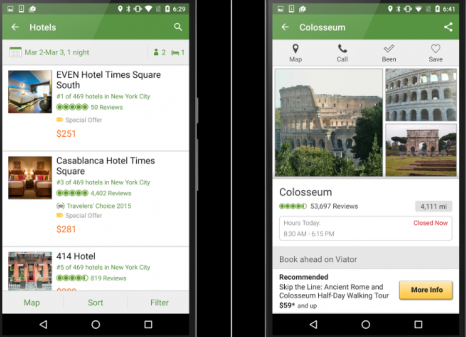 Trip Advisor is a complete app when it comes to travelling. You can find everything about your destination with thousands of reviews, opinions, photos, videos and precautionary steps for the place you want to visit, including hotels, airlines, bars, restaurants, museums and many more. You can also find nearby attractions via the ‘Near Me’ feature in the app. The best thing, however, about the app is that it covers every country, even some small islands and Third-world countries too. It has its own discussion forum where some positive and constructive discussions are generated every day. So next time you are leaving for a trip, don’t forget to download TripAdvisor on your device. There are many ride-sharing services and Uber is the king of them. After a quick car request, you can directly contact the driver, and track the car’s location and possible time of arrival. The fares vary depending on different vehicle types. Available in 554 cities in 77 countries, the app also allows you to connect a credit card or bank account to help you travel cash free. 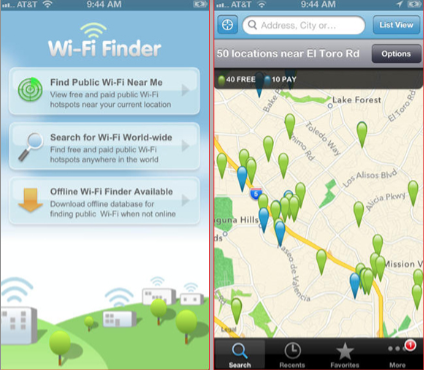 The Wi-Fi finder app helps you find the nearest Wi-Fi hotspot, regardless of which country you are in. It is a great way to make use of free Wi-Fi availability, since many countries have very costly data roaming charges. The app covers a large area, meaning you don’t need to be near any particular spot for suggestion. The good thing is that it also works offline so you can download maps before leaving for the destination and follow the directions to reach the Wi-Fi location. 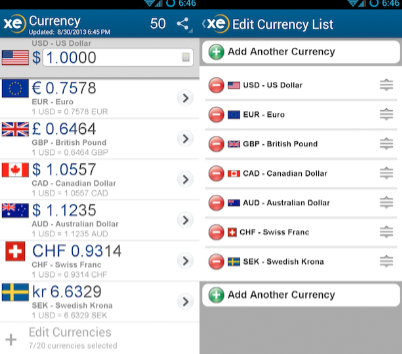 XE currency is a very useful app for currency conversion and any related information about exchange rates. It supports every national currency used worldwide and you can track up to 10 currencies simultaneously. Exchange rates are live and accurate, plus you can set frequency of updates and notification. The best thing is that the app stores the currencies you have tracked and the history is available offline. Its importance increases when you are travelling back-to-back to many countries. I have personally used all the above mentioned apps and found them to be extremely useful. You may not require all the apps, all the while you travel but having them on your Smartphone will make your journeys much more convenience. These apps are available on both Android and iOS. Feel free to comment below and share a new app or an alternative that you think I should list. 1 in 3 not coming to work on Friday, but how many will 'chuck a sickie'? Sygic GPS Navigation and Maps. The best app with awesome UI.